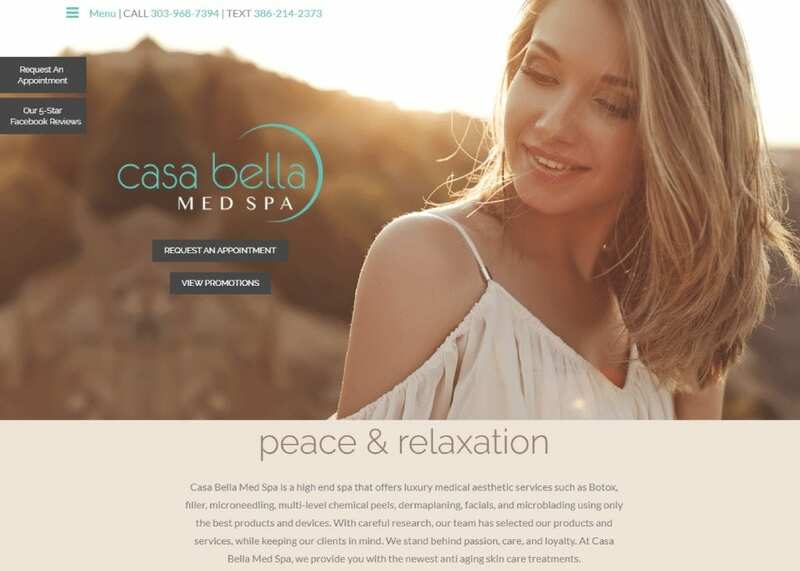 Casa Bella Med Spa, like other Med Spas, focuses on aesthetics and rejuvenating the patient through a variety of treatment options. The home page contains a traditional header menu, followed by a large image and a link to schedule an appointment. Next, we spotlight several featured services, from laser skin treatments to dietary counseling. Those considering a visit to Casa Bella can embark on a digital tour of the office and also get to know the overseeing physician before scheduling an appointment. Overall, we would consider this custom med spa web design to be user-friendly, easy to navigate, and highly informative. When dealing with a specialty such as med spa, we want to always keep the layout spacious and luxurious to compliment the potential audience at hand. We went with a light tan and brown color theme for this website. The grey background and light color tones are soft and neutral that is relaxing and soothing for site visitors. We made sure to keep all the color elements classy and timeless to match the med spa philosophy. When using neutral and light tones sparingly, it can give the impression that something is very natural and organic. The brown and tan blend together to help add a sense of comfort and reliability to the website. We added a widget on each web page (located on the right side) to allow visitors with the accessibility to request an appointment or to examine previous reviews left on the med spa’s Facebook page. This can not only add reliability and credibility to the website but also gives patients additional trust and security when debating on setting up an appointment. This is a highly visual website that utilizes a full-width view and large imagery on the home page. Interactive pictures link to other pages and services on the website. They also enlarge when selected. There is also a hamburger menu that replaces the traditional navigation menu. This gives readers more space to read and visualize their next consultation with Casa Bella. When dealing with cosmetics, patient reviews and testimonials play a huge role in bringing in new patients. No one wants to have their faces examined by an inexperienced med spa! We included patient reviews throughout the site to emphasize Casa Bella’s reliability and trustworthiness. There are also offers for new clients available as well. With Casa Bella, there are no patients left behind! This further emphasizes Casa Bella’s dedication to treating any and all cosmetic and aesthetic issues that a patient may have. At the end of the day, med spas are meant to be relaxing and soothing. We made sure that the website reflected that very image. The imagery on the site is organic and peaceful – nothing is ever pushed into the reader’s face. The use of reviews and testimonials also place reliability and trust in Casa Bella’s services.